The area around the head of the Nile Delta has been populated for millennia; this is perhaps the most fertile land in Africa and the cradle for the great civilisation of the ancient Egyptians. Modern day Cairo, however, is a world apart from this long and glorious history; congested, confusing, chaotic, it can take time to acclimatise to what is the largest metropolitan area in Africa. Take that time, though, because once you’ve hardened to the touts and the hawkers this is a truly exhilarating place, nicknamed the ‘City of a Thousand Minarets’ for the proliferation of Islamic architecture. There is a great deal of genuine beauty here, not to mention the wonders just beyond the city borders, monuments to the ancients that will have you gaping in awe and thinking “somebody made that?”. And for the urban anthropologist, the traveller that likes nothing more than losing himself among the back alleys and side streets of a fascinating new location, there are few more wondrous places than Cairo. Cairo’s position as a gateway between Africa, Europe and the Middle East mean there are plenty of top class options to choose from. Fairmont, Four Seasons, Marriott, Staybridge Suites and Radisson Blu all have top class hotels in central locations. The Naguib Mahfouz Café, hidden in the heart of Khan al-Khalili shopping district, offers a superb selection of Middle Eastern dishes. The service at Abu Sid can be slow, but it’s worth the wait as this is widely regarded as being the best Egyptian food in town. 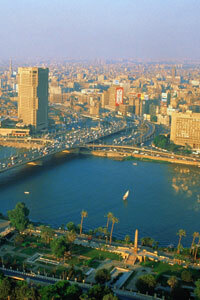 The Pyramids at Giza and the Sphinx are two of Egypt’s most famous ancient wonders, easily accessible from Cairo. But the old city itself is well worth exploring, particularly the 700-year-old bazaar at Khan al-Khalili.